Leadership from New Zealand included Gavin Treadgold, emergency manager, director of the Sahana Foundation and member of CrisisCommons. Gavin began connecting the group to official emergency management response. Robert Coup began leading the technical response and Tim McNamara joined to help with the volunteer plan. The map was launched before the processes and people were in place. Patrick Meier and George Chamales (Konpa Group) provided their expertise. Plans and processes began to solidify. George recommended a migration to Ushahidi as soon as possible to handle the expected high load. And, he referred to the essential Ushahidi resource to help guide (PDF) the team. The CrisisCamp NZ team reached out to two other map projects and merged their efforts. Patrick, Cat Graham (Humanity Road) and myself coordinated to launch the Crisismappers Standby Task Force to assist with the 50 volunteers that Tim had massed. The SBTF was a perfect fit to handle the transition. 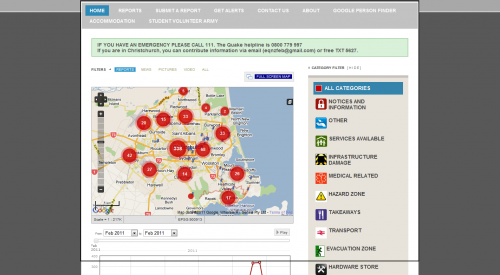 The migration to an Ushahidi instance - eq.org.nz happened within 6 hours of the earthquake. The SBTF officially completed their tasks yesterday. The Sydney Morning Herald also noted that: "Another site, eq.org.nz, is taking pressure off emergency services by plotting official and user-generated information and reports on a Google Map." CrisisCamp NZ teams are working around the clock to keep up the response. Their tireless efforts have amassed 779 reports, 781 different locations, and 69, 143 unique visitors to the site. Partnerships exist with NZ media, universities, Google Person Finder and the Student Volunteer Army. Tim is coordinating mapping/techncial situation rooms on IRC, Skype and, in person, including Optimal Usability.. As well, they continue to work very closely with the Ushahidi development team on a number of open ticket items. Resources Needed, Status Report and Partners http://wiki.crisiscommons.org/wiki/CrisisCampNZ http://wiki.crisiscommons.org/wiki/Christchurch_NZ_Earthquake_21.02.2011 http://crisiscommons.org/blog/2011/02/23/update-from-crisiscamp-nz-volunteers http://crisiscommons.org/blog/2011/02/24/crisiscampnz-brief-update Also see: http://www.google.com/crisisresponse/christchurch_earthquake.html CrisisCommons will hold an after action review once the response effort is complete. We wil make CrisisCamp NZ AAR announcement on the @crisiscamp twitter account and via our community mailing list.